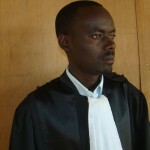 Audace Gatavu, a human rights defense attorney in Bujumbura, Burundi, has eyewitness experience with the plight of people living with HIV/AIDS in Burundi’s criminal justice system. In his work as a legal assistant for the Network of People Living with HIV/AIDS, he saw people living with HIV/AIDS abandoned by their families and friends and without any access to counsel because neither their families nor the government were willing or able to pay for attorneys. These experiences moved Mr. Gatuvu to use his legal skills and connections within the legal community to create a network of pro bono defense attorneys to provide legal counsel to the most vulnerable within the criminal justice system who are without any legal defense. Project: This project consisted of training workshops for volunteer lawyers, visits to prisons and courts to research potential clients’ cases, legal consultations, and courtroom defense of people living with HIV/AIDS within the criminal justice system. Mr. Gatavu worked to prevent a very vulnerable community from facing wrongful imprisonment, discriminating and mass violation of their rights. Results: Mr. Gatavu’s JusticeMakers project has successfully negotiated hearings in fourteen different cases that had been pending indefinitely. Mrs. Gatavu has participated in twenty-six public hearings during the implementation of his project. As a result, one person has been released and four other cases are under appeal. In consultation with the Bujumbura Bar Association, Mr. Gatavu established a core group of volunteer lawyers for the judicial defense of cases involving PLWHA. He organized a small training workshop for the core group of volunteer lawyers on criminal procedure, human rights notions and on the effects of criminalizing HIV transmission. He also held 4 small workshops for 5 lawyers. In addition, meetings with Presiding Judges in Kayanza, Ngozi and Kirundo District courts were organized to accelerate the cases of accused with and/or vulnerable to HIV/AIDS. Mrs Gatavu supported drafting the defense’s conclusions and correspondence that needed to be presented before the judicial authorities. He also submitted bail applications in accordance with Decree N°100/183 of June 25, 2012 on pardon which provides in article 3, paragraph 2, that “shall benefit from the entire remission of sentence the prisoners affected by incurable and advanced diseases, attested by a medical commission upon the entry into force of this decree”. Time has been the main constraint to the implementation of Mr. Gatavu’s project since criminal cases were only heard once a week in Ngozi courts. Moreover, the lack of commitment of prosecutors makes the procedures extremely slow since evidence must be given during the hearings but the prosecutors do not provide the court with any of them. Furthermore, to overcome this delay, Mr. Gatavu regularly negotiated with the court to reschedule hearing dates. During the implementation of Mr. Gatavu’s JusticeMakers project a new law on criminal procedure was adopted. Many innovations concerning the rights of the detainees were implemented and had a significant impact on the judges perceptions. Additionally, the right to council for minors involved in cases where punishment is equal or beyond 25 years has been repealed.